Comprehensive photo report of a 17-day tour of Charleston SC, Savannah GA, Washington DC Mall, and an Amtrak cross-country train ride through beautiful mountains and scenery. First the Amtrak maps, which you can view and/or download for printing by left or right clicking on the thumbnails below. 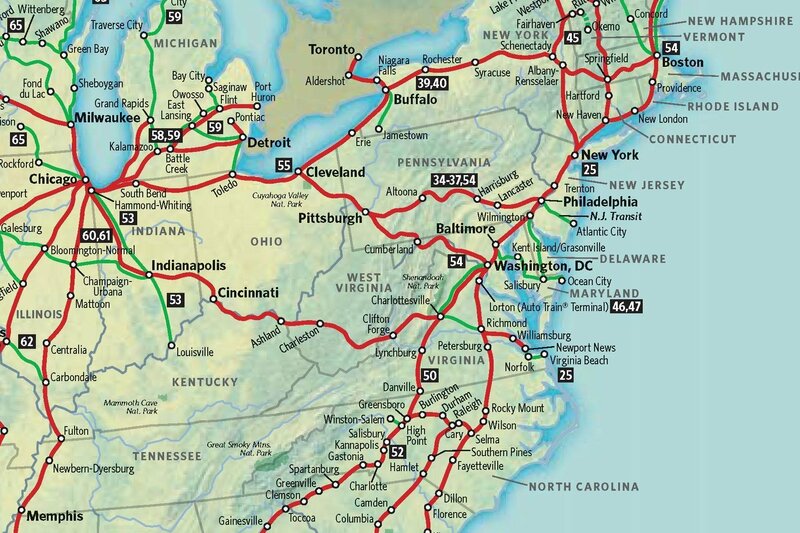 The maps focus on the routes from San Francisco to Chicago and Washington DC, and from Washington DC to Savannah GA. Each map has been sized to print on standard 8 1/2 by 11-inch paper. Click here for the complete map from which these print-sized maps were made. 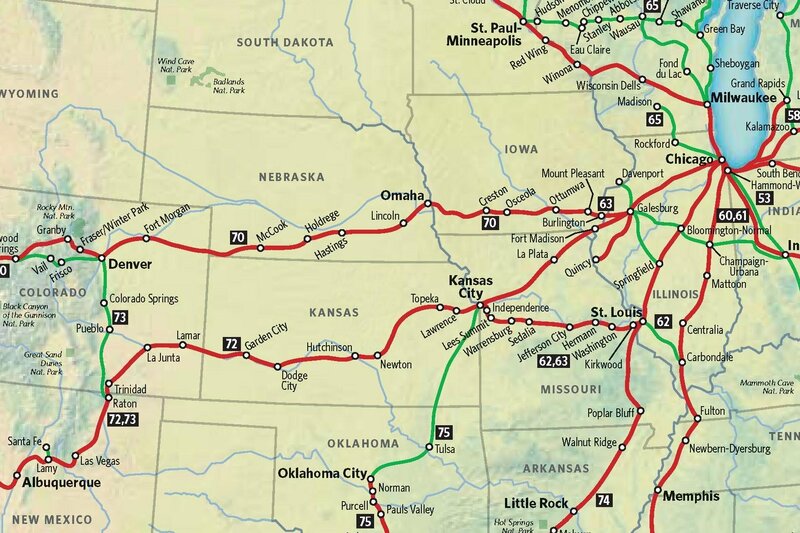 These one-page maps are the ideal personal guide as you ride the rails. 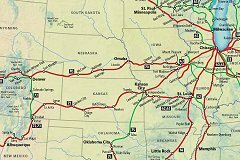 You should also know what to expect on an Amtrak Superliner train, which you will take on this journey. Click here to take a series of Virtual Tours through the various cars of a typical train. The photos have some holes in them from imperfect conversion into the Virtual Tour format but give almost all the information you're looking for. It is important to view these if you've never been on a day and night trip by train, for example to see how much room you have (very little in a roomette) for personal belongings. Mary and I know next to nothing of The South and the places we're likely to tour, so the only way I could figure to make lodging arrangements was to create a virtual tour via the Internet and, in particular, Google Maps. Only by doing this could I make any rational choices for where we should stay during the trip. 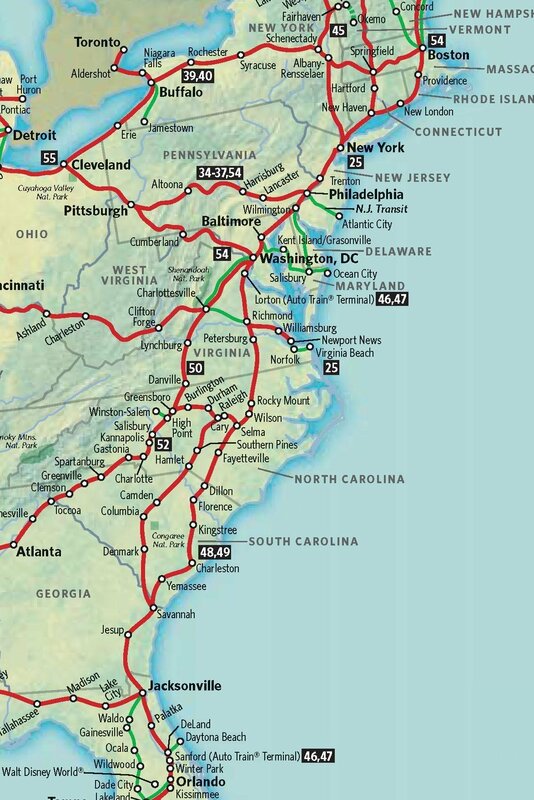 I began with our Amtrak itinerary, which you can view as a pdf document by clicking at left in this sentence. We take the California Zephyr Monday morning, April 9, 2012, leaving the Sacramento station at 11:09 am. We change trains in Chicago and at 6:10 pm Wednesday take the Capitol Limited to Washington, DC, arriving at Washington Union Station just after the lunch hour, at 12:40 pm on Friday. You can see Washington Union Station near the upper right corner of the Google map below. Based on this map, I booked reservations at the Phoenix Park Hotel at 520 N. Capitol St., NW, which is a few hundred yards west of the station. The hotel is also close to the capitol building and the mall, where we will spend two and a half days visiting selected museums. We also have the option to take a Gray Line tour to Jefferson's Monticello, a 11-hour tour including the trip to and from Monticello. The tour begins and ends in Union Station, so we could again walk from the hotel. But right now we both feel we'd rather focus our limited time on the multitude of best-in-the-nation museums. We depart Washington, DC at 9:55 am Friday from Union Station on the 89 Palmetto to points south, and arrive in Charleston, SC at 7:15 pm. The Amtrak station closes at 3 pm, so we're on our own to get to our lodgings at Anchorage Inn, 10 miles south. I called the inn and the desk clerk said she would send someone up to get us. We're getting Southern Hospitality already! And how did I decide on Anchorage Inn in central Charleston? By using Google maps, to first of all find where central Charleston is. 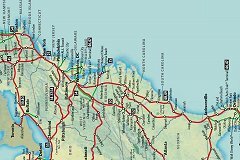 Then I did several searches on things to see and do in the area and found that the inn is fairly central to the places we'd like to visit. In the process, I created my own Google map which shows all these places and Anchorage Inn. Google has excellent software to look up addresses and place permanent pins at points of interest. Throughout this preview I recommend that you left click on links and open them in a separate browser tab. Click at the end of this sentence to see my map for Charleston, SC. But if you haven't yet used this type of Google map first read the next paragraph. I have six pins for Charleston. A two-line description of each pin is in a list at the left of the map. You can click on either items in this list or on the pins to see what is located at each pin. In the following I go from pin to pin to take you on our planned tour. When you're at a pin, I've provided links in the pin boxes that you can use to get information and view what I've scouted out as the best videos that describe the attraction at the pin. 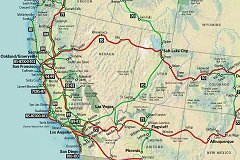 I suggest that you right click and open the information links and videos in separate tabs so you can easily click back to the map no matter how deeply you follow further links. Old mansions and plantations are what I associate with the South, so I focused on three plantations which are prominently displayed on the Internet. Based only this information, the most impressive is Middleton Plantation. Boone Plantation is also interesting because it was used in the filming of The Notebook, a favorite romantic movie of ours. Below is a video about the Middleton Plantation, which can also be accessed from a link in the Middleton pin box on the map. Videos about the Boone Plantation include its use in filming The Notebook. The best of these is also below. It includes other sites we plan to see in Charleston. The website for Boone Plantation includes a video entirely about the plantation and has been displayed above. 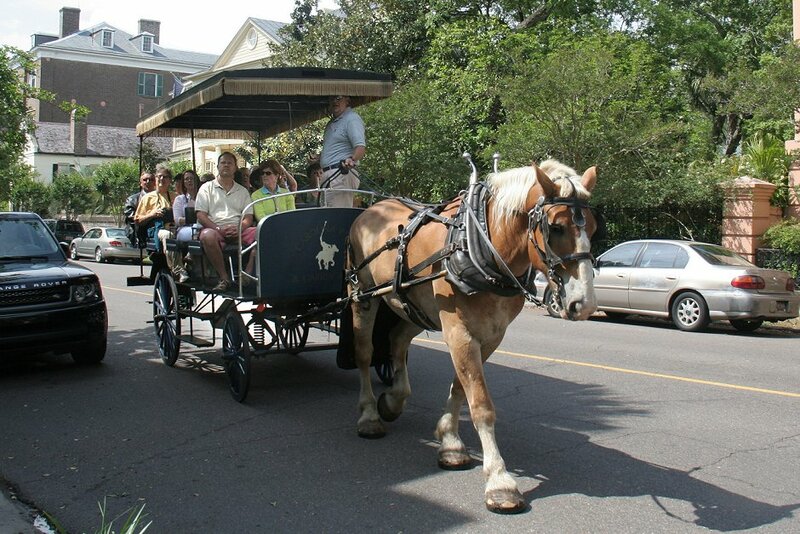 I'm sure we'll also take a horse carriage ride around town and do some of the many things available near our Anchorage Inn lodging in the French Quarter, including all that fattening Southern Cooking. We head back to the Amtrak station to re-board the 89 Palmetto from Charleston at 7:15 pm on Friday, April 20 and chug down to Savannah, GA, where we arrive at 9:03 pm. Before I plunge you into the next Google map I think you should see a six-minute video introduction to Savannah. OK, now you're all choked up and excited, so here's my Savannah Tour Map. This map includes a pin at Tybee island, which is about 25 miles southeast of the Savannah Historic District where we will spend most of our time. The first thing you'll have to do is zoom into the pins in the historic district. As you do you will notice that there is an isolated pin about 3 miles east of the district. This is the Amtrak station, and we'll have to get one of our lodging staff to pick us up from the station. My point here is that you should continue zooming in until you see only the pins in the district. Now begin clicking on the attractions in the list on the left. 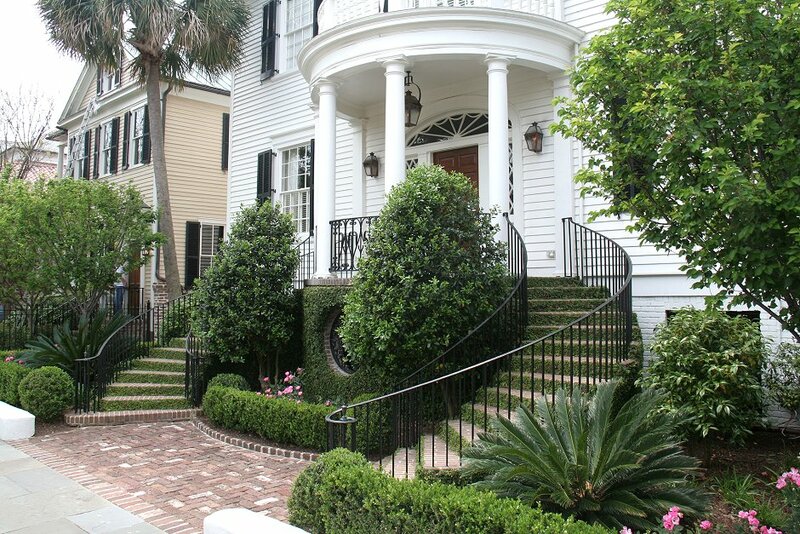 The first as you go down is the Owens-Thomas House near Oglethorpe Square. Right click on the link to a video in the pin box for the attraction. Display the video page in a separate tab. The 4-minute Savannah tour video includes a bit about the Owens-Thomas House, Oglethorpe Square, nearby Chippewa Square and other city sights. The other link in the pin box is to information specifically about the Owens-Thomas House. The next item on the list is the Staybridge Suites where we're booked for five nights. Next are the Trolley Tours, with the pin placed at the tour origin. If you go to its video link you will see a small window in the upper left of the page that you can click on to see the trolleys in action. They are very open for great visibility and you can get on and off the trolley system to look at things that strike your fancy. We'll definitely be taking one or more trolley tours because this is a great way for "mature" folk like Mary and me to take the weight off our legs and still get around. The Cotton Exchange is very close to our lodging so we'll go there to see the exchange and learn how it was vital to Savannah's early economy. I've put a video link into the pin box that gets you to a very informative even though short video about the exchange. I also added a link to a 3.5-minute video about how Negroes built the First African Baptist Church, told by one of their descendents. The City Market is where the action is. I anticipate shopping there during the day and taking in some Jazz in the evening. We'll probably also take a riverboat tour (another easy-on-the-legs activity for us octogenarians). There is just so much to see in Savannah -- good thing I booked for five days. And somehow we've got to get out to Tybee Island. My pin-box link to information about the island includes a 5.5-minute video of things to do. The video is inserted below. This was Dave Lindberg's favorite thing that he and family did in Savannah. 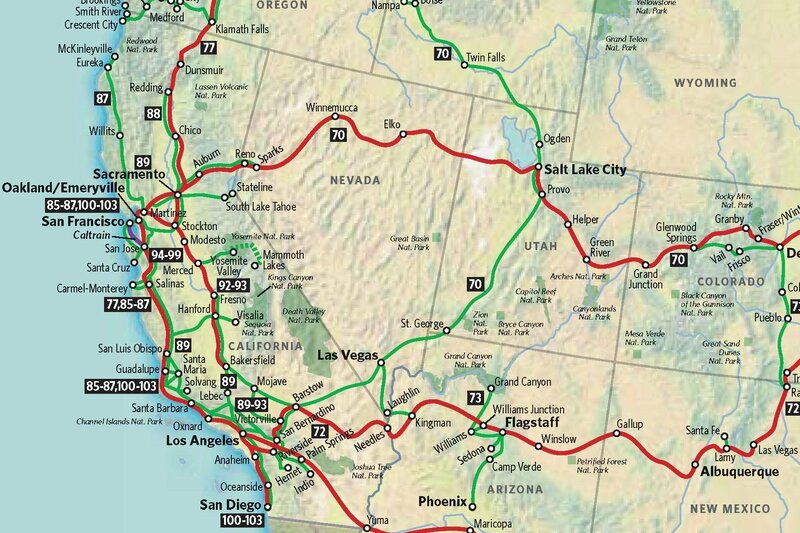 After 17 days of trains and touring we'll hop onto a airplane back to Sacramento on Wednesday evening, April 25, 2012. I wonder what my post-tour web page will be!